“I was walking in the streets, when suddenly I began to see fire balls fall from heaven all around me. 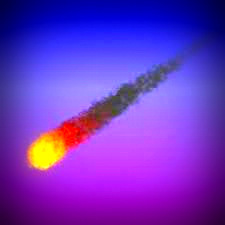 On closer inspection, they looked like meteors or asteroids burning with fire falling from heaven all over the place. Suddenly, a man (same man I have seen in my previous visions) started to guide me and tell me where to go so that I would not be killed by these falling balls of fire. I believe in the near future, there will be an event that will cause balls of fire (asteroids/meteors) to begin to fall all over the planet. I believe that this event is associated with the arrival of Planet X, Nibiru, Destroyer, Wormwood to our solar system. As this object gets closer to our inner solar systen and planet earth, fireball events will take place more and more all over the earth. These balls of fire will destroy and burn wherever they fall. Only God will be able to protect His people supernaturally through His angels. It is later than people realize. People make sure that you are right with God, if not turn from evil and seek Him while there is still time. Luke 21:11 "And great earthquakes shall be in various places, and famines, and pestilences; and fearful sights and great signs shall there be from heaven." Luke 21:25-28 "And there shall be signs in the sun, and in the moon, and in the stars; and upon the earth distress of nations, with perplexity; the sea and the waves roaring; Men's hearts failing them for fear, and for looking toward those things which are coming on the earth: for the powers of heaven shall be shaken. And then shall they see the Son of man coming in a cloud with power and great glory. And when these things begin to come to pass, then look up, and lift up your heads; for your redemption draws near." Ezekiel 38:21-23 "And I will call for a sword against him throughout all my mountains, says the Lord GOD: every man's sword shall be against his brother. And I will enter into judgment against him with pestilence and with blood; and I will rain upon him, and upon his hordes, and upon the many people that are with him, an overflowing rain, and great hailstones, fire, and brimstone. Thus will I magnify myself, and sanctify myself; and I will be known in the eyes of many nations, and they shall know that I am the LORD." Luke 17:28-30 "Likewise also as it was in the days of Lot; they did eat, they drank, they bought, they sold, they planted, they built; But the same day that Lot went out of Sodom it rained fire and brimstone from heaven, and destroyed them all. Even thus shall it be in the day when the Son of man is revealed." Matthew 16:2-3 "He answered and said unto them, When it is evening, you say, It will be fair weather: for the sky is red. And in the morning, It will be foul weather today: for the sky is red and overcast. O you hypocrites, you can discern the appearance of the sky; but can you not discern the signs of the times?" Psalms 11:5-6 "The LORD tests the righteous: but the wicked and him that loves violence his soul hates. Upon the wicked he shall rain snares, fire and brimstone, and a horrible tempest: this shall be the portion of their cup." Note: Go to the Q & A page on this website http://theappearance.com/new-page-34.htm and scroll half way down the page to read more about this topic.